Wonder why some doctors grumble when a Medicare patient walks in the door? It's likely because the government program typically pays only 80% of what private insurers do. Medicare has the bad rap of being a big, bloated government program, but it's not because it's overpaying doctors. CNNMoney analyzed the "allowed charges" for five common procedures, using data provided the Centers for Medicare and Medicaid Services and Truven Health Analytics, a research firm. The differences can be stark. 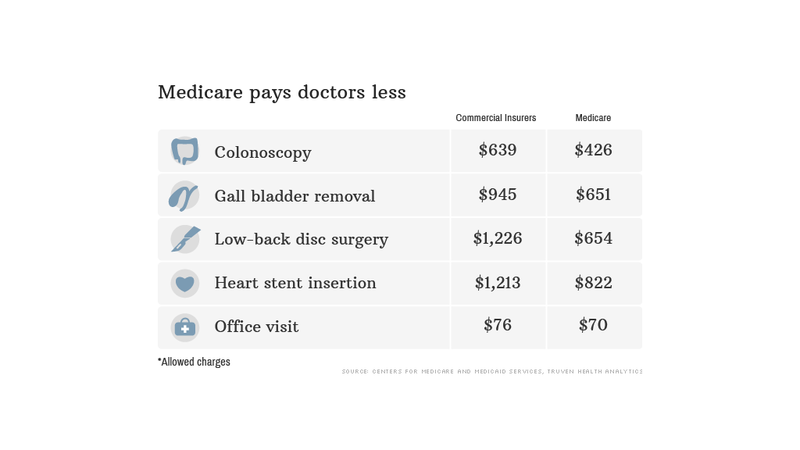 Private insurers allow an average of $1,226 for low-back disc surgery, while Medicare will only permit $654, for instance. And the gap can grow wider depending on where the patient is. In New York, insurers allow $1,352 for a gall bladder removal, compared to $580 for Medicare. Some services are more comparable. For office visits by established patients, for instance, Medicare will allow 92% of what insurers do. Overall, Medicare's allowed charges are roughly 80% of the charges allowed by private insurers - about the same as they have been since 1999. Sometimes, however, the government does reimburse health care providers more. In Florida, for instance, a doctor doing a colonoscopy in his office will receive $395 for a Medicare patient, but only $342 for one covered by private insurance. How does Medicare get away with paying less? "Medicare doesn't negotiate rates. It sets them," said Stuart Guterman, vice president at The Commonwealth Fund, an independent health policy research group. And doctors might be okay getting less per procedure because Medicare patients tend to need a lot of care. As a result, the total bill can add up. Nearly 4,000 doctors were paid more than $1 million from Medicare, according to data released this month. Private insurers, meanwhile, can't cut rates that deeply or they risk a revolt by doctors, who may opt to leave the carrier. "When you want to market your health plan, you want to say all the great doctors are in your network," said Anne Fischer, director of Truven's Center for Healthcare Analytics. 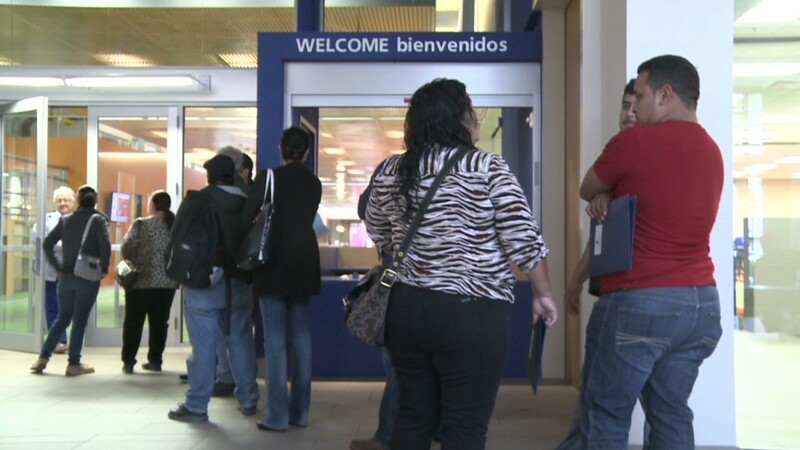 This balancing act became evident when the Obamacare exchanges launched in October. In order to keep premiums low, insurers offered plans with more limited access to doctors and hospitals. Many health care providers complained that insurers' rates for exchange plans were too low, so they opted not to participate. Why, then, is Medicare considered bloated? It's more about use than prices, with the government under more pressure to pay for whatever services the doctor prescribes or the patient wants, Guterman said. Insurers, meanwhile, have more tools to limit potentially unnecessary procedures. These include pre-authorization requirements to determine whether a treatment plan is medically justified. "Medicare spending goes up because people use it more," he said.